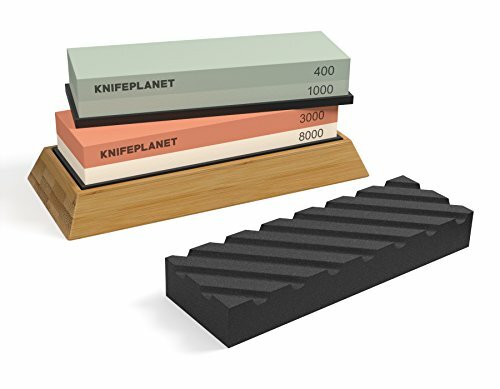 The combination stones offer Coarse, Medium and Fine grits to sharpen all kinds of knives. The Flattening Stone will help you keep your water stones flat all the time. With a total of 4 sharpening grits, you will be able to take care of very dull knives without problems. You will be given access to our useful online learning material and instructions: a set of videos and articles to help you improve your sharpening technique. These resources where made by professional knife sharpeners, specifically for beginners and intermediate sharpeners. These resources will guide you and teach you knife sharpening from scratch. You can also get in touch with us anytime if you have any questions concerning sharpening specific knives. - Soak the sharpening stones in water for around 10 minutes before sharpening. NO oil/lubricant is needed. Only water. If you have any questions about this product by KnifePlanet, contact us by completing and submitting the form below. If you are looking for a specif part number, please include it with your message.